Now that you’ve cheated at Priceline and/or Hotwire, you’ve got to pack your bags! Unfortunately, most domestic airlines charge $15 for the first bag and $25 for the second bag. To smack those fees down fast, we need to be smarter than the airlines (easy). Bundle Wrapping benefits you by allowing you to use a smaller bag so you can carry it on with you avoiding baggage fees altogether or allow you to pack everything into one bag versus two, saving you the extra baggage fee. Additionally, bundle wrapping also reduces wrinkles since you don’t crease any clothing. Bundle wrapping requires some easy prioritization of your clothing. Start by having your jackets zipped, shirts buttoned and pants folded in half. Have your socks, undergarments, dob kit and other soft goods together; this will form your core to bundle your clothing around. When you begin bundle wrapping, you should keep all shirts and jackets face up, unless it is a tailored jacket, which should travel face down. Start by laying the jacket out flat first <step 1>, if one is being packed, then lay a shirt in the opposite direction <step 2>. Continue alternating until you’ve packed all jackets and shirts. Next, lay the waist of your pants at the under arm portion of the shirt <step 3> and continue alternating until all the pants are packed. Lay your core <step 4>, the soft goods mentioned above, in the center. Now, take your pants and wrap them over the core <step 5> and wrap the shirts around the bundle <step 6> that you’ve built. Wrap the final jacket or shirt around the bundle <step 7> and place it in the suitcase, then strap everything down <step 8> to minimize shifting during travel. 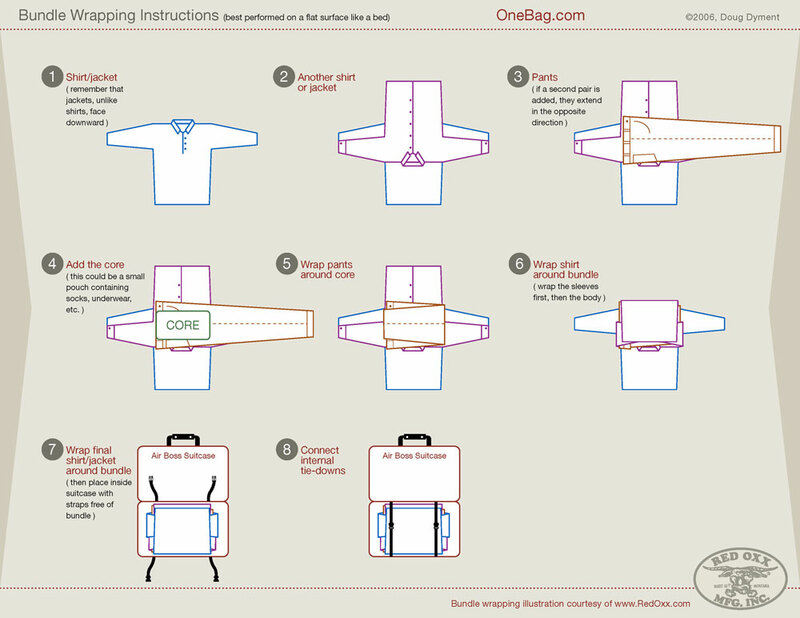 This packing method may seem complicated, but you only need to review the diagram (courtesy of Doug Dyment, OneBag.com) once and it becomes a snap. For your convenience, I’ve included the diagram above as a pdf. Your choice to pack efficiently can now save you the $15 first bag fee that most airlines charge and even the $25 second bag fee. You’re ready to have a great time on your next trip. Safe travels on your next adventure!